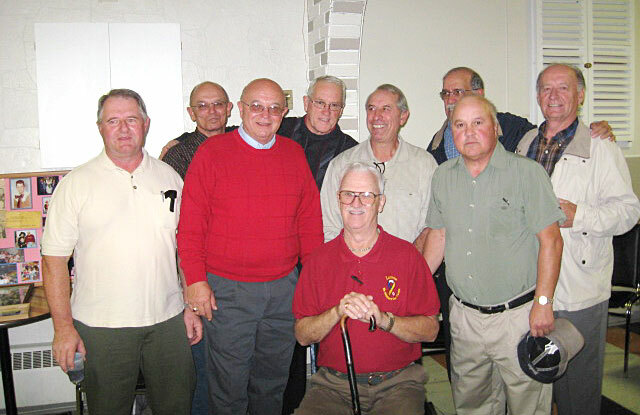 During the recent Rahne- Boucher family re-union (Oct 18, 19/08) some old ball buddies got together to reminisce about the glory days in the sixties of fast ball in Capreol. The Capreol Juniors was a softball team that was the brain child of Don Prescott. Don lived in Capreol for a number of years and was very active in softball as an umpire and later went on to be an executive member of the O. A.S.A., Ontario Amateur Softball Association. In 1960, Don decided that since Capreol already had a strong men's ball team that it would be a good idea to start a junior program. He approached the Capreol Legion, who also supported the senior team, and the members agreed to the idea. Don then called all his boys and started the team. Initially, there was no league for the team, so the boys practiced and played exhibition games, venturing as far as Elliot Lake. Realizing that he had a pretty talented group of young men, Don entered the Juniors into the local league, The Nickel Belt Fastball League. The Juniors fared quite well playing against teams like the Garson Bombers and enjoyed some very spirited contests against the Capreol Mazzucas, a team that went on to be a dynasty in Ontario fastball. Capreol became known as a fast ball power house, with both the senior and junior teams winning all Ontario championships. Many of the juniors went on to play long careers with the senior team. Thanks to the Capreol Legion and Don and Naida Prescott, who became the den mother of the juniors, for contributing to the rich sports history of Capreol. Hopefully all the old juniors and seniors will come back to Capreol to participate in our August long weekend celebrations that will be a homecoming for all who participated in sporting activities in Capreol. More information will follow on this but please start spreading the news to all your team mates who played for the Hawks or for Stibby's Team Capreol any of the school teams etc.